Married 56 years, James and Arminta Guthrie revisit the past with a trip to the old Saugus Train Station, where they were station agents for nearly 16 years. 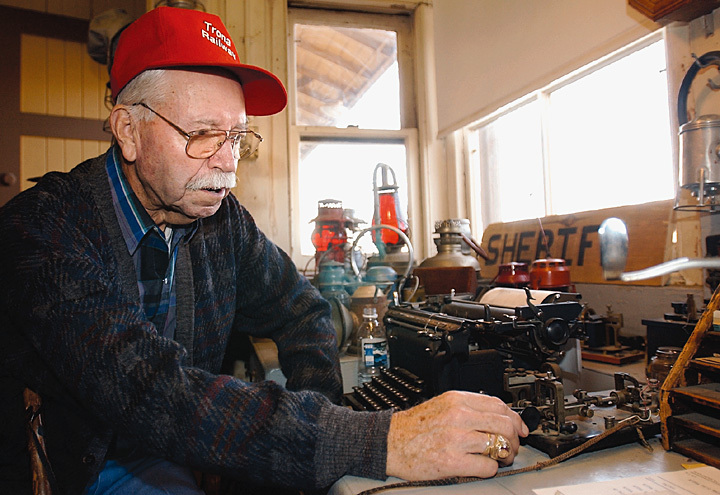 James "Bob" Guthrie, depot agent at the Saugus Train Station for nearly 16 years, recalls using the telegraph machine he called "Bug" during a return trip to the station Saturday. In the equation of trains, planes, and automobiles, trains are the most important to James "Bob" Guthrie. They are the vehicles that helped feed his family and kept them together. For close to 16 years, Guthrie and his wife, Arminta, were the depot agents at the Saugus Train Station until it was closed in 1978. They also raised four daughters and a son in the family quarters above the depot, which is now a museum in Heritage Junction within William S. Hart Park. An older daughter was married and lived away from home when the Guthrie family settled in the Santa Clarita Valley in 1962. "When the kids were teens, their friends wanted to spend the night at the depot," Arminta said. "We had to walk over kids sleeping on the floor just to get to the bathroom." The Guthries, who now live near Paso Robles, are in their late 70s and are experiencing health problems. Soon, they will enter a Central Coast hospital for testing. But before they do, the Guthries decided to drop by their former home while visiting their son, Ed, 52, of Castaic, and daughter, Linda, 59, of Sylmar, for the holidays. Although the remainder of the Guthrie clan is scattered throughout the United States, they managed to be together, in spirit, for Thanksgiving. "My daughter, Cheryl, who lives in Minnesota, found a prayer on the Internet and sent each family member a copy to read at the exact same time on Thanksgiving," said "Mom" Guthrie, as she is known by her children's friends. 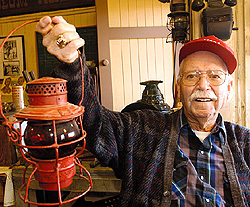 James Guthrie holds up an old lantern, similar to the type he used to signal passing locomotives while working as a station agent at the Saugus Train Station. 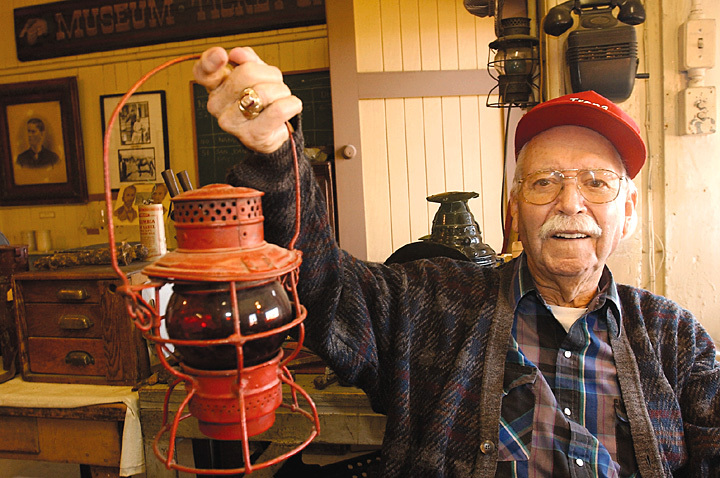 Pop Guthrie said being the Saugus Train Station agent was a very interesting part of his railroad career. 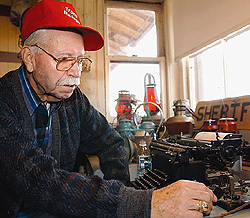 A native of Pittsburgh, Kan., Guthrie began his career at the Kansas City Southern Railroad in 1941. Various jobs took him to Mexico from 1950 to 1958, to Oxnard from 1958 to 1962, and finally to Saugus in 1962. As the depot agents the Guthries sold passenger tickets, checked baggage, and sent and received telegram messages for Western Union. "I made it to California 100 years too late for the Gold Rush," Guthrie said. "I made a pretty good living and our family was together while we worked." Through the years, the Guthrie children attended schools in the William S. Hart Union School District, graduating from Hart High school in the late 1960s and late 1970s. Linda, 59, lives in Sylmar; Ed, 52, in Castaic; Cheryl, 53, in Minnesota; Marla, 48, in Santa Maria; Debbie, 45, in Houston, Texas; and Nancy, 43, in Kissimmee, Fla.
"They are all scattered, but we keep in touch by cell phone and e-mail," Arminta said. After their retirement in 1986, the Guthries bought a 31-foot motorhome and lived in Big Pine Creek, near Bishop, Calif., while working for the concession within the campground. "I think it added a few years to our life," Bob said. Nowadays, the "bookends" as Arminta likes to say, spend their days on the back porch of their home in a gated community near Lake Naciemento, watching their birds and reflecting on their 56-year marriage. "We have a very good life," Mom Guthrie said.